Our family discovered Braun’s electric toothbrush 17 years ago. Our dentist in Texas suggested we start using it and by coincidence, we then met one of Gal’s relatives who told us she must use an electric toothbrush to save her gums from receding. We put one and one together and decided to try. After using the electric toothbrush for only a short time, we realized there was no way back. Even now, when one of us leaves home overnight and ends up using a regular (manual) toothbrush, we feel our teeth are not as clean. This may be starting to look like I am writing a commercial for Braun (hey, that would be an idea), but I am not sure if other electric toothbrushes are not as effective. It is just what we have been using. What I wanted to tell you about was what Braun is not doing so well. No, putting them upside down is just yucky. My tip for Braun, of course, is to have each brush head colored and even styled differently, but until Braun thinks more “user friendly”, you can do it yourself at home. Take your favorite nail polish and paint your brush head in the color you want. 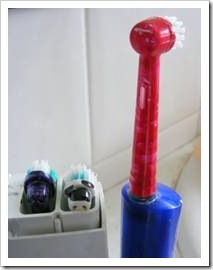 This will make it easy to find your toothbrush among the other brushes from any direction, even when only the top of it is visible (see photo). Just put the head on the motor while it stands on the charger and paint it. Make sure you cover the top well to find it easily later. Let it dry for 3-5 minutes and there you have it – pick your brush in an instant. Oh, I am glad it is useful. Ha, i have exactly the same problem with our electric brushes, you tip using nail polish just solved our problems :) Thank you.